The last time he was in Perth, Sir Paul McCartney serenaded local dolphins with some Frank Sinatra. 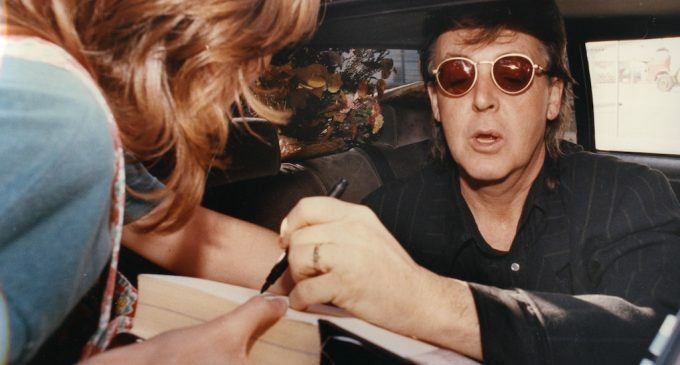 The Beatles legend, late wife Linda and their children went swimming in the Mandurah Estuary in 1993, when his first Australian solo tour kicked off at Subiaco Oval. Chatting this week from New York, where he’s making an album with top producer Greg Kurstin (Adele, Beck), McCartney recalls taking a one-man sailboat out on the water and soon being joined by a pod of dolphins. “That was a big thrill,” the 75-year-old Liverpudlian says. “I thought ‘You know, I heard they were intelligent creatures so I’ve got to communicate’. The animal lover and famed vegetarian has no doubts about which songs his human fans would like to hear when he starts only his fourth Australian visit at nib Stadium on December 2. “If you come to see me, you’re going to want to see me do some Beatles songs,” McCartney says. The One on One tour will be his third to WA, following 1993 and Wings’ tour of 1975 when Linda took him horseriding. Perth missed out on the Fab Four’s fabled Australasian invasion of 1964. Kicking off in April last year, a mere six months after his previous Out There tour wrapped in late 2015, One on One features a set list loaded with Beatles favourites. Most notably, McCartney and his long-serving touring band play A Hard Day’s Night, a song he hadn’t performed since 1965, mainly because John Lennon sang lead vocals on the original. He’s half-joking. But Macca is serious about giving bang for your buck at his gigs — on this tour he’s averaging 39 songs per show. Some songs pick themselves, such as Hey Jude. But at over seven minutes long, he could play three or four other songs in the time it takes to belt out the 1968 ballad. In addition to playing Beatles, Wings and solo hits, the evergreen pop maestro has reached all the way back to 1958 to revive In Spite of All the Danger, a song by Fab forerunners the Quarrymen. “I thought it would be good to try the very first song that we ever recorded and bring the show through to the most recent we recorded,” says McCartney, referring to the handful of tunes from 2013 album New. The greatest partnership in pop music began 60 years ago when, thanks to a mutual friend, McCartney met Lennon at the St Peter’s Church Hall fete. “John was a great guy, you know,” McCartney says. “You feel very lucky that we got together because the two of us were very good for each other. You know, each of us had the bit that the other one didn’t have, so when you came to write a song we got quite good at it, quite quickly. McCartney’s next album should be unveiled mid-next year. As always, love is a central theme, while he has also penned a not-so-veiled dig at Donald Trump and climate change deniers. The purest of pop songwriters says there’s still something magical about “goofing around” on a guitar or at a piano to create a song out of thin air. “You feel very proud of yourself that you’ve done it,” he says. While creating music has barely changed for the English icon, touring is a far less taxing proposition than the hard days and nights of screaming fans and Beatlemania. “I think people think of the road as it used to be, which is Greyhound buses and terrible hotels and no sleep and partying all night,” McCartney says. “It’s much more relaxed now. Maybe reconnect with Mandurah’s Sinatra-lovin’ dolphins? Paul McCartney plays nib Stadium on December 2. Tickets from Ticketmaster.